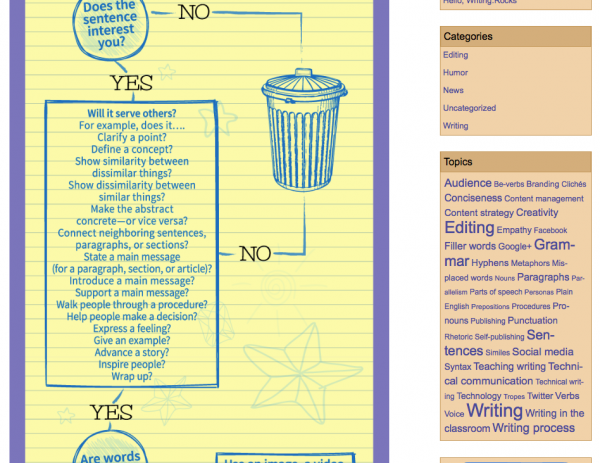 If your organization isn’t categorizing its blog posts, consider the possibility. 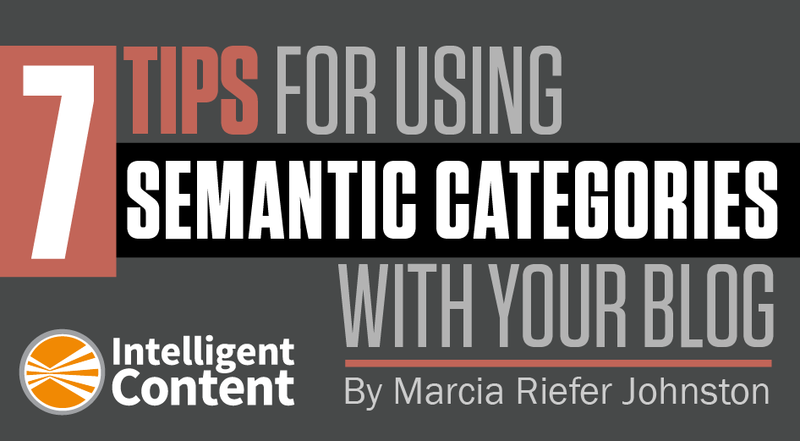 Categorizing can help your audiences, and your content teams, get more out of your content. 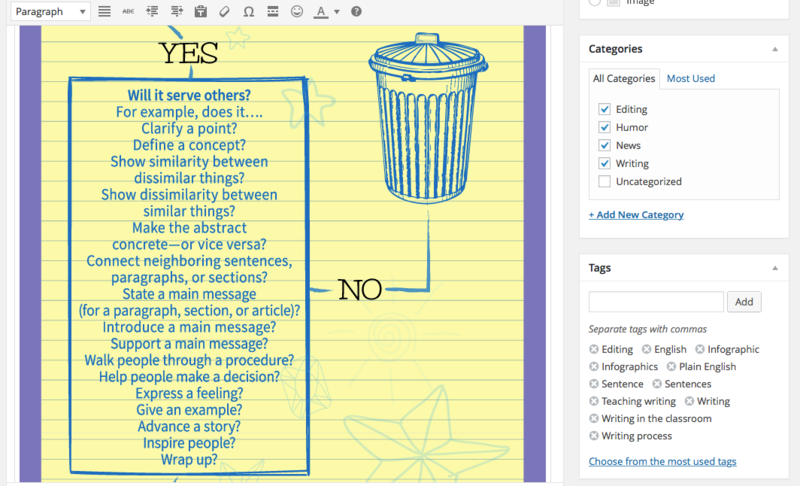 Vocabulary note: For simplicity, I use the term categories here in the general sense of semantic categories, covering both “categories” and “tags,” as your blogging software (WordPress, for example) may refer to them. If your blogging software happens to offer both categories and tags, you may want to use one or the other or both. Some people make their decision based on a book analogy. They think of the blog as a book, categories as chapters, and tags as index entries. Whichever type of semantic category you use, whatever terms your software uses, the idea is to create useful groupings. Ready for some tips? Here are some of mine. I hope that you’ll share yours, too, in a comment below. Review your categories when you look at your editorial calendar. 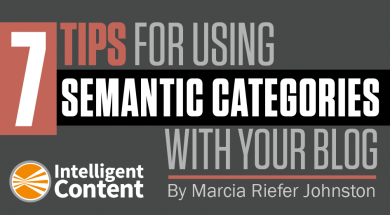 You may want to run a series of articles that use the same set of categories, or you may want to spread out your topics across categories in a balanced way. If you have only a handful of articles in some categories, or if it has been a while since you addressed some categories, maybe it’s time to create new articles in those categories. Assign each new article to all relevant categories. Don’t make yourself crazy with these decisions. Use common sense. If someone who clicks on a certain category would likely appreciate seeing that article listed, then assign it. Otherwise, don’t. Decide which of your published articles merit categorizing. It may not make sense to take time to categorize every article on the blog, but do categorize your most popular articles and articles that have enduring value for your audience and for your organization. Verify that the categories assigned to each article appear somewhere readers can see them: near each article’s title, near the end, or off to the side. Seem obvious? I confess, as I was writing this article, I realized that I had failed to do this on my own blog. I had been assigning categories, but I hadn’t made them visible to visitors. Fixed! Open a categorized article, and click on its categories. All articles in that category should appear as if you had hauled up – effortlessly and instantly – a bucketful of related articles. If you want your categories to appear on various device types, test them on various devices. This behind-the-scenes peek at one of my own blog articles shows the categories and tags (at right) that I assigned to this article in WordPress. These are all semantic categories – metadata that serves to group my blog posts in meaningful ways. Here’s how my blog article appears to visitors using a desktop system. 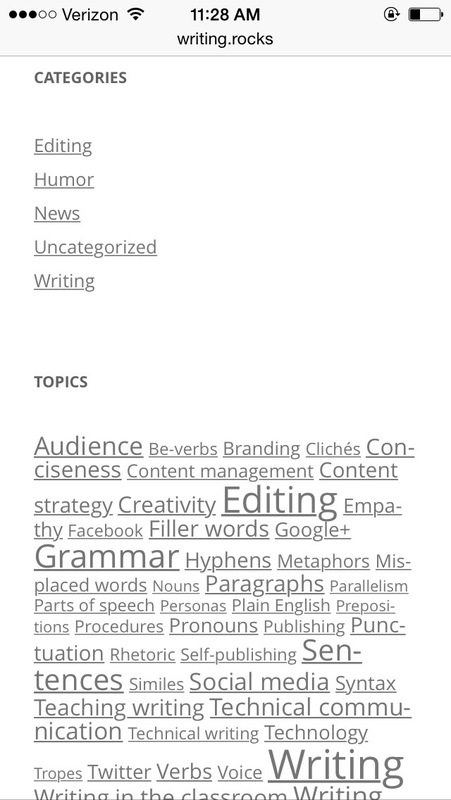 My semantic categories (WordPress’ “categories” and “tags,” here labeled “topics”) appear at right. Anyone can click these items – “Sentences,” for example – to bring up all the posts assigned to that semantic category. Here’s how my semantic categories (including categories and topics) appear to visitors using an iPhone. In this case, the semantic categories appear below the article. You can’t get categories right or wrong. Try some out. Start with a few that you’re sure you’ll use regularly, and build from there. Please share what you discover. Drop us a comment below with your own tips! For more on basic categorization, see Splitting Tigers, Lumping Rabbits by Rachel Lovinger. For more tips, see Best Practices For Using Categories And Tags In WordPress by KeriLynn Engel.